We are very excited to now have Stratgear located in Porto, Portugal stocking our pedals! You can check them out here, and today they will be at the Gnration music market in Braga. AVAILABLE EXCLUSIVELY FROM PEACH GUITARS We’ve teamed up again with the fine folks at Peach Guitars to offer another limited edition Broadcast, the PG-24V-FS. Alessandro “Asso” Stefana is an Italian guitarist, multi-instrumentalist, composer and producer. He is best known for his collaboration like guitarist with MIKE PATTON’s “MONDOCANE” and to be the guitarist and co-producer of VINICIO CAPOSSELA, one of the most important and influent Italian songwriters right now. He’s also founder of the Italian band GUANO PADANO that bases its sound on the Italian Soundtracks and Spaghetti Western’s music influences mixed with surf/psychedelic/jazz/country and experimental. The BC-24V-USA runs internally at 24 volts from a standard 9 volt supply. The increased voltage gives extra headroom and a tighter low end – fantastic if you are looking for a little less saturation and grit, but without losing that unique sound of the Broadcast. The BC-24V-USA comes finished in either oxide-red or turquoise-green and can only be purchased for a limited time through our fine stockists located in the USA. Very excited to announce that Regent Sounds are now stocking our pedals. They are located on the infamous Denmark Street in central London…go pop in and say hello! 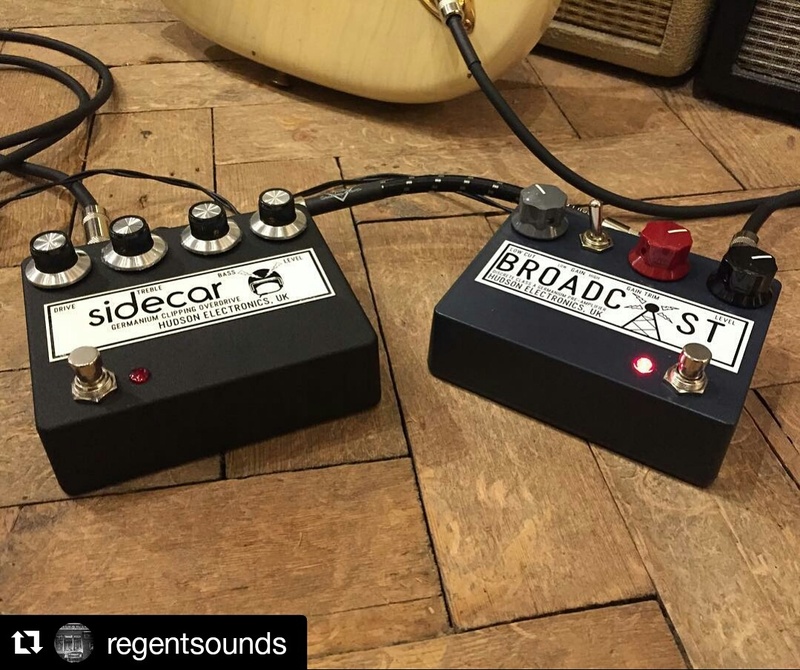 Superb demo of the new Sidecar by the fine folks at Livingroom Gear Demos! Our first 15 Broadcast pedals came fitted with an NOS Mullard-made CV5712 Germanium transistor. We received a few messages about these CV series transistors so here is some additional information on these transistors. The CV series of semi-conductors (diodes / transistors) and tubes were manufactured and specifically labelled for use by the UK military. These UK inter-service military specification devices were manufactured by the likes of Mullard, Philips, Valvo and Newmarket but usually are not printed with the manufacture’s name. Each device normally is printed with its model number, for example CV5712, followed by a series of letters and numbers. These letters and numbers can be used to determine where the part was made and when. Many CV series devices have an equivalent commercial device for example the CV5712 is equivalent to the more common OC71. It is thought that a high number of CV devices were standard commercial devices but manufactured to tighter parameters and high tolerances. From experience testing these devices, I tend to agree with this. Whilst the CV transistors don’t out perform their commercial cousins, readings I took from various batches of the CV devices do tend be much more closely grouped than the standard commercial devices; though this may only hold true for the the batches I’ve been able to test. You can look up CV equivalent devices on the CV REGISTER. especially on later devices. The K means that it has been manufactured to specification and the B indicates that approval was given by UK authorities. The next letter or letters is the FACTORY IDENTIFICATION CODE and denote/s which factory the device was manufactured in. More examples of Factory Identification Codes can be found here. The final four numbers denote the date of manufacture of the device. The first pair of numbers denote the year of manufacture and the secound pair which week with the year the device was built. For example a device printed with 6428 was manufactured in the 28th week of 1964.